KUBINKA /Moscow Region/, June 29. /TASS/. More than 400 enterprises of Russia’s defense and industrial sector and about 100 foreign delegations will take part in the Army 2016 international military and technical forum, Russian Defense Minister Sergei Shoigu said on Wednesday. The Army 2016 international military and technical forum will be held in the Moscow Region on September 6-11, he added. “More than 400 Russian defense enterprises and about 100 foreign delegations are planned to take part in it [the Army 2016 forum],” Shoigu said at a meeting of the Defense Ministry’s board. The participants in the forum will be able to present their static expositions at the new versatile training and demonstration center. “The center will accommodate defense developments and achievements, as well as the national expositions of Russia, Belarus, Kazakhstan, Armenia and other countries,” Shoigu said. For the first time in the history of the forum, the capabilities of military and special hardware will be demonstrated at the Alabino practice range in the Moscow Region, as well as in all military districts and the Northern Fleet. It was reported earlier that more than 100 items of military hardware and equipment were planned to be shown at the forum. “The 1st Smart Industrial Technologies 2016 international exhibition will be held within the framework of the Army 2016 forum,” he said. “The Smart Industrial Technologies 2016 exhibition will display highly efficient equipment and technologies for industry retooling,” Shoigu said. MOSCOW, May 23. /TASS/. Samples of weapons, military and special equipment of the ground forces will be presented at the Army 2016 international military-technical forum to be held in Kubinka outside Moscow on September 6-11, 2016 in, the Russian Defense Ministry press service reported on Monday. “Dynamic display of equipment, aimed at demonstrating the capabilities of Russian weapons, military and special equipment in the field will be carried out at specially equipped test courses and sites of tracked and wheeled armored vehicles of the Alabino military range,” the press service quoted the Russian Ground Force Commander Colonel General Oleg Salyukov. According to him, the forum will feature the Tigr-M (Tiger-M) multipurpose vehicle with a fighting unit with Arbalet-DM remote control, the T-72B3 tank, Iskander-M tactical missile system, the Tornado-T and Tornado-S multiple launch rocket systems, MSTA-SM self-propelled howitzer, Khosta self-propelled artillery piece, Tor M2U anti-aircraft missile system. The demonstration will take place in open air grounds for large samples of weapons, military and special equipment and in the pavilions of the Patriot Congress and Exhibition Centre of the military-patriotic recreation park of the Russian Armed Forces in the town of Kubinka. More than 50 research institutions and organizations of the Russian defense and education and science ministries will take part in the scientific events of this year’s International Military-Technical Forum Army-2016, the Russian Defense Ministry said Wednesday. MOSCOW (Sputnik) — The Army-2016 forum is scheduled to take place on September 6-11 near Kubinka, a western suburb of Moscow. The scientific and business events will include conference, briefings and roundtables. “The priorities of the scientific and business program are developing proposals for organization of effective cooperation of defense industry’s companies and organizations and military control bodies in order to create advanced technologies, advanced systems and armament, military and special equipment,” the statement read. 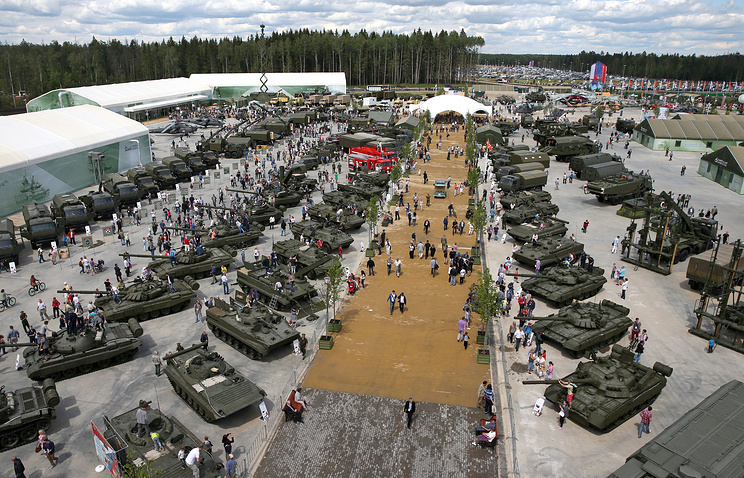 The Army-2015 forum ran from June 16-19 at the Russian Armed Forces’ Patriot Park in Kubinka. 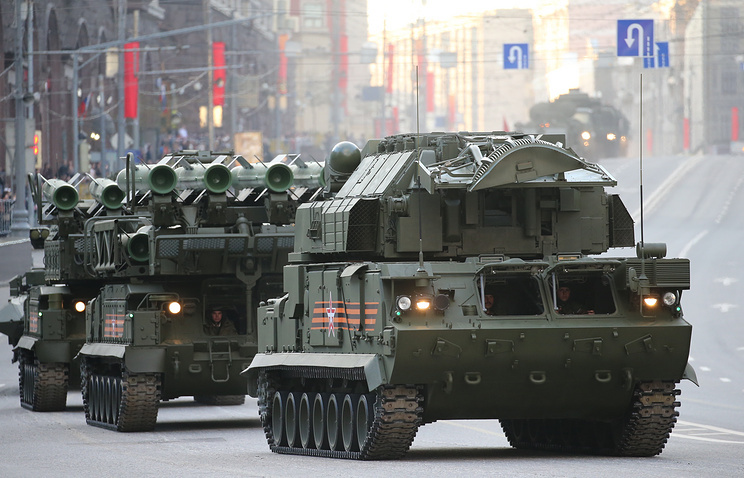 The event was organized by the Russian Defense Ministry to demonstrate the latest in Russian weaponry. Representatives of as many as 70 countries, including 38 official delegations, took part in the forum, which also attracted tens of thousands of spectators. March 16 – Exhibition “Intellectual industrial technologies” is planned within the II International military and technical forum ARMY-2016, which will take place in the Patriot park (Moscow Region). The leadership of enterprises of the Military Industrial Complex will be able to get familiarized with the requirements of the Russian Defence Ministry for production of weapons, …military and special equipment, modern solutions for automation and robotization of the production process as well as trends in industrial design. Everyone will have the opportunity to take part in topical workshops such as technologies of production and usage of composite materials, development of additive and cryogenic technologies in the military sphere. Two plenary sessions are included in the exhibition programme. The topic is development of production capacity and experimental basis of the military enterprises.